Although they are not often directly associated with one another, retirement and estate planning go hand in hand. Both involve planning for a long-term, often partially unknown future. Without the advice and guidance of an experienced financial professional, it is easy to make a mistake that could negatively affect you or your heirs. 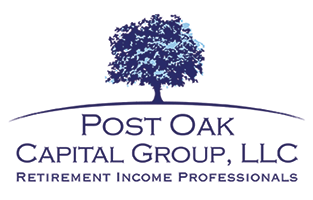 Post Oak Capital Group stands ready to assist with all of your retirement and estate planning needs. Retirement marks a major transition from one phase of life to the next. Regardless of your age or profession, you have certainly earned the right to step back and let someone else take the reins. If you have not adequately prepared for retirement, however, that knowledge might be cold comfort. It simply is not sufficient to expect Social Security and your company pension - if you even have one - to provide for your long-term needs. A seasoned Post Oak Capital Group Sugar Land retirement professional helps you face retirement with confidence. We start with a comprehensive financial review that incorporates your long-term goals and lifestyle needs into an estimate of how much money you require for your retirement. With an idea of your anticipated needs during your later years, we devise retirement planning and retirement income growth strategies that help you build toward that goal. Moreover, we provide incisive advice and a stunning breadth of informational resources to help clients make qualified distributions and minimize tax liabilities. We strive for nothing less than total financial well-being at every stage of your retirement. Estate planning enables you to manage your assets and affairs while you remain on this earth and exercise effective control over the distribution of your wealth following your death. Done properly, estate planning ensures that your desires are faithfully executed after you are no longer able to express them on your own. It also ensures that your healthcare wishes, including the grave decision to remove life support, are executed in the event that you become unable to communicate. Our professionals have experience in a variety of estate-related matters, including working with your estate planning attorneys regarding your estate wills, living wills, title issues, assigning power of attorney, planning for business succession, establishing medical directives, minimizing estate taxes, creating trusts, philanthropy and more. Our goal: to ensure that your wealth is distributed as you see fit and accrues to the benefit of those who matter most. To learn more about our retirement and estate planning services, contact a Sugar Land fee only financial planner by calling (713) 960-6949 or filling out the website contact form today. *Please note that we are not attorneys and do provide legal advice. Clients should consult with their own legal advisors to learn more about the rules that may affect individual situations.